This is an excellent collection of over 600 lots of historic gold, silver and other collectible coins and currency. 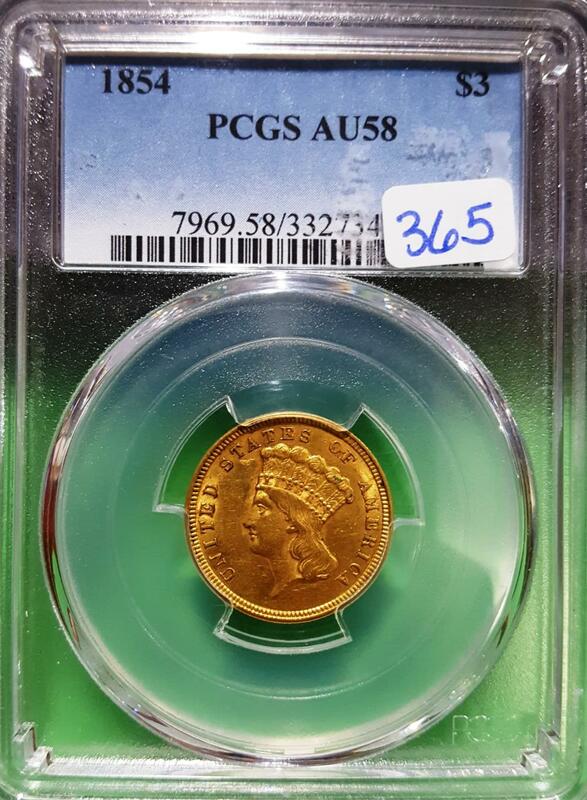 Coins are in excellent condition and there are many key dates and rare high quality coins. 1. WAIVER OF WARRANTY: All lots are sold AS-IS Where-Is, and ALL SALES ARE FINAL. No statement regarding condition, kind, value, or quality of a lot, whether made orally or in writing in this catalogue or elsewhere, shall be construed to be an express or implied warranty, representation, or assumption of liability. Any such warranty is WAIVED. 2. The auctioneer shall have absolute discretion in determining the successful bidder. At the completion of the auction, title to the offered lot will pass to the bidder acknowledged by the auctioneer. The bidder thereupon assumes full risk and responsibility and will pay full purchase price for the said lot. 6. If the buyer fails to comply with any of the Conditions of Sale, Martin Auction Company reserves the right to hold such defaulting buyer liable for the purchase price; to cancel the sale, retaining as liquidated damages any payment made by the buyer. 7. ESTIMATES: The estimates provided are our opinion of the price that a willing buyer would pay for the Property at auction. These estimates are opinion, based, where possible, on prices paid for comparable items sold in the past. They are neither a representation nor a prediction of the actual selling price that will be realized at auction, post-auction sale, or upon resale, which may be substantially different from these estimates. We shall not be liable in any way for such a difference. Martin Auction Company requires that the merchandise be held on premises until the receipt of payment in full is verified. Martin Auction Company undertakes the execution of online bidding as a convenience for clients and is not responsible for any inadvertent failure to execute bids, or for any error in the execution of bids. Regardless of the circumstances, if you click BID and subsequently BUY an item, you have purchased it. We will not cancel the sale of an item due to an accidental click. We are not responsible for a loss of internet connection and technical complications beyond our control. Any dispute by either party against the other will be settled by arbitration in Howard County, Missouri. Any dispute between the parties shall be governed by the law of the State of Missouri, notwithstanding any conflicts of law principles. 1. The successful bidder agrees to pay a buyer's premium in the amount of 20% of the sale price on each lot. 2. Acceptable forms of payment include Visa, MasterCard, and Paypal, cash, cashier's check, money order, wired money or personal check. 3. Payment in full must be made by the successful bidder within 4 days of receiving an invoice. Credit cards will be automatically charged if payment is not received within 4 days. Interest charges will apply to invoices paid after this period expires. We reserve the right to require payment in full of the sales price at the moment of the successful bid. Each transaction necessary to collect insufficient funds will have a $30 fee imposed. The purchaser assumes full risk and responsibility for the purchased property, including all costs and expenses of handling, shipping, insurance, taxes, export, and otherwise, and is liable for the full purchase price, plus the buyer's premium. Unless other arrangements are made and confirmed in writing, all items must be removed within 15 days of the auction. On the first business day following that time period, items remaining will be turned over to a storage facility. The buyer will be responsible for handling and storage costs. Handling costs will be a minimum of $50. Storage rates will carry a minimum charge of $50 per month per item. All items handled or stored will be at the buyer's risk. Storage charges are accrued monthly and must be paid in full before items are released. We are not liable for any damage to items after the sale. It is the responsibility of the prospective buyer to inquire as to the condition of a specific lot PRIOR to bidding. Condition reports are statements of opinion by the staff of Martin Auction Company, and/or independent consultants, it is not a warranty. CONDITION WILL NOT BE INCLUDED IN THE DESCRIPTION OF THE LOT. Please email requests to codymartin@martinauctioncompany.com. Emails must include all contact information. Requests are answered in the order they are received. All potential buyers should be sure they have read and agree to the Conditions of Sale. NO RETURNS ARE ACCEPTED ON THE BASIS OF CONDITION.